A home needs constant care and attention, that truth is something you discover almost immediately upon becoming a homeowner. You suddenly find that you have a new full-time job as handyman…only you don’t have the time or maybe all the skills to be a handyman, because you have other skills and another job. Meanwhile, windows break, garbage disposals clog, faucets leak, tiles crack, and so on and so on and so on. At the same time your busy life continues and the little drips and cracks pile up until your “to-do” list looks insurmountable. Sometimes, things have been let go to the point that it is no longer a little problem that you can take care of, but now you need someone with a little more expertise you might just lack the expertise to handle a particular repair. When you need help with home improvements and/or home repairs, you don’t have to worry about how you are going to get it done, just call Andy OnCall and your job will be correctly done in no time, leaving you to spend your free time on other things. Our Handymen have years of experience in fixing common, and not so common, household concerns both inside and outside of the house. With our Handymen’s diverse skills we can install a new vanity, lay new tile, build a deck or install fencing. If you need painting, drywall repair or replacement or something more routine like gutter cleaning or furniture assembly, our handymen will be ready to perform the task quickly and professionally. Because we understand that when it comes to hiring a handyman, finding an individual who has the appropriate knowledge and expertise is of the utmost importance, Andy OnCall only employs the most highly-skilled craftsmen who have extensive experience in their trade. All of our Handymen are fully insured and bonded, so you can rest assured that when you have a handyman from Andy OnCall on the job, your home will be in the hands of a trustworthy professional. We are confident that you will be satisfied with our services and join the hundreds of other Chicagoland homeowners who use Andy OnCall exclusively as their go-to Handyman. Beyond our traditional handyman services, Andy OnCall also performs major or minor remodel of bathrooms, kitchen (face-lifts), family room, home office or other room(s) in your home. We can build you a deck, enclose a porch, finish your basement, attic, or garage; add a bathroom, convert a bathroom, install a ramp for the disabled, or upgrade the exterior of your home. If you or a family member wants to stay in their home, or someone is moving into your home, that has physical challenges that makes it increasingly difficult to get around, then Andy OnCall can help. 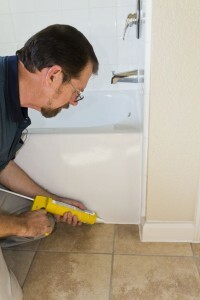 Our handyman services include: installing grab bars in showers and tubs, accessible ramps, widening doorways, bathroom or kitchen modifications, installing handrails, changing door hardware to lever-style, lowering light switches and other devices to make more easily accessible, adding shower benches and hand-held shower heads. The bottom line is your home should be safe and accessible for you, your family and your visitors. If that is not currently the case, we offer “aging-in-place” consultation, design services and installation of items that make it easier for loved ones to visit, or move in, or for you to stay in your home. As the seasons change, so does your list of home maintenance tasks. Call Andy OnCall for all your home maintenance needs such as gutter cleaning, caulking, changing smoke alarm batteries, swapping screens and storm windows, and other weatherizing maintenance tasks. Count on locally owned and operated Andy OnCall for professional residential handyman services and home improvements projects including carpentry, painting, doors, and more. All of our handymen are licensed, bonded and insured for your protection. We are a general contractor and provide top-quality work at affordable prices. From drywall repairs and pressure washing to bathroom repairs, we do it all with meticulous attention to detail and personalized customer care. We understand the busy schedules of our Chicagoland clients and will work with them to complete the job at their convenience. With a variety of services to choose from, we are sure you’ll be happy working with us. With more than 20 years of experience in residential and commercial handyman services, Andy OnCall is the only name you need to know when it comes to general handyman and repair services for your home or office. Call Andy today to find out what we can do for you. In addition to the handyman and home improvement services that we offer for homeowners, Andy OnCall can handle a variety of commercial remodeling, maintenance, and repair services if you’re a business owner who is in need of help keeping your office in top condition. Condominium buildings and commercial properties have many of the same maintenance and repair issues that single family homes do. We are proud to aid several businesses and condo associations in keeping their properties in good repair. With Andy OnCall, home improvements just got easier. We have been providing handyman and remodeling services to Chicago, Wilmette, Evanston, Skokie, Glenview and most other northern suburbs for more than 20 years. For more information about the wide variety of handyman and home remodeling and repair services that we provide, contact us today! We believe our work to be our best advertisement; and our customers, our most effective testimonials!